J. Sheehy, Walter Osborne, Cork, 1974, no. 128. London, Institute of Painters in Oil Colours, 1885, no. 314. Born in Dublin, Osborne was the second of three children of the animal painter William Osborne. After his studies at the Royal Hibernian Academy, and under Charles Verlat in Antwerp, Osborne moved to France in 1883 to spend the year at Brittany, further developing his plein-air method at Quimperlé, Pont-Aven and Dinan. 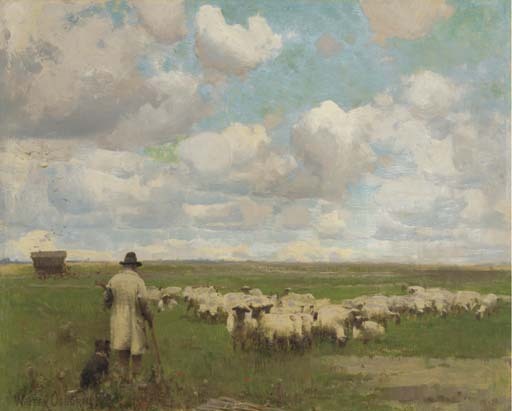 By 1885, the year in which he painted the present work, Osborne had begun to earn his living as an artist, travelling around the rural communities and coastal villages of England and Ireland, that offered the kind of landscape and motifs that captured his imagination, in particular shepherds and sheepfolds, subjects that he depicted on small panels and boards. He often worked in the company of other artists, and most particularly with Edward Stott during the 1884-85 period. 'Osborne's paintings of the eighties continue along similar lines to his work in Antwerp and Brittany - rural genre scenes, and occasionally pure landscape. More often than not his figures are just part of the countryside, generalised types rather than individuals ... He painted peasants in the landscape not out of social or political conviction, but because the kind of painting that interested him belonged to the French Realist tradition which had had strong social and political overtones' (J. Sheehy, Walter Osborne, National Gallery of Ireland exhibition catalogue, Dublin, 1983, p. 64). The portrait painter and stained glass artist, Sarah Purser (1848-1943) was a friend and distant cousin of Osborne. As a leading light in the Dublin art world, she was generally considered the natural successor to him in the role of the city's leading portrait painter. Hugh Lane commenting in a letter written after Osborne's death in April 1903, 'it must certainly be your duty to finish his half begun portraits (being the only portrait painter left to us) you will be recognised as his heir (artistically)' (see J. Sheehy, op. cit, p. 143).